Rhonda asked me about the particulars of the solar eclipse. For home or for the Greater Toronto Area. 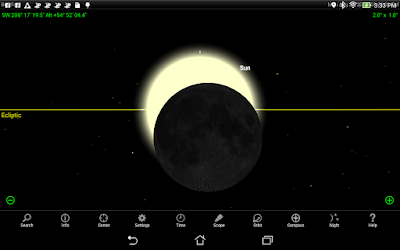 I ran some simulations in SkySafari and Stellarium to determine the local circumstances. At first contact, the Sun would be about 57° up and around 175° azimuth. So almost due south. A little ahead (or left) of the meridian. At the mid-point, the Sun would be about 54° above the horizon and at 208° azimuth. When the Moon stopped blocking the Sun, Sol would be at 45° and 235°. Still well up; to the south-west.